Johny Hendricks is a former UFC Welterweight champion and a former UFC Welterweight division runner-up. Johny Hendricks is currently 35 years old according to his date of birth September 12, 1983. Bigg Rigg is one of the best clinch fighters ever in the UFC. He executes brutal uppercuts while he holds the opponent with the other hand or tries to execute a brutal takedown. He is a pure leech when he clinches up. He is also known for some spectacular throws. 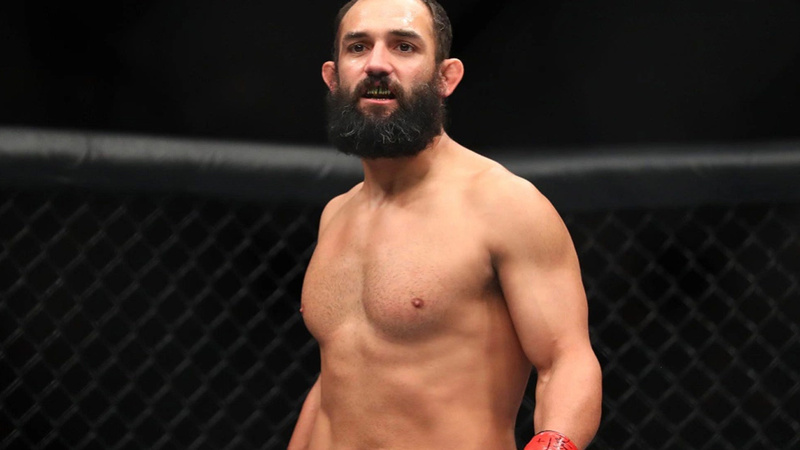 Johny Hendricks prefers hammer fists on the ground, while his favorite weapons in the stand-up are his left cross, left hook, and weaving overhand left. Johny gives an advantage to short punches over long-range strikes. He usually stays away from kicks. Johny Hendricks is a purple belt in BJJ. His submission defense is brutal – nobody has ever finished him! However, he is vulnerable to high kicks, right cross, and left spinning back kick to the body. He has also became known for weight issues, despite he even switched one division up! Johny Hendricks had his MMA debut on September 28, 2007, at Battle of the Cage 16 versus Victor Rackliff, whom he defeated via third-round TKO. He had the score of 5-0 when he joined UFC. Johny Hendricks had his UFC debut versus Amir Sadollah at UFC 101 on August 8, 2009, and he won via TKO after only 29 seconds. His next opponent was Ricardo Funch at UFC 107 on December 12, 2009. Hendricks won via unanimous decision. Maybe one of Johny’s most uncertain fights was the one versus TJ Grant at UFC 113, on May 8, 2010. Bigg Rigg won via majority decision. Johny then ran Charlie Brenneman over on August 7, 2010, at UFC 117, winning via TKO. Johny Hendricks had her first UFC loss versus Rick Story on December 4, 2010, at The Ultimate Fighter 12 Finale. Rick Story won via unanimous decision. Hendricks then defeated TJ Waldburger on March 26, 2011, at UFC Fight Night 24, earning his first Knockout Of The Night Award. Mike Pierce was a very tough rival at UFC 133 on August 6, 2011, but Hendricks won via split decision. The biggest sensation of his career was the match versus Jon Fitch, long-time #2 Welterweight division contender. Fitch has never been knocked out before, but Bigg Rigg changed history at UFC 141 on December 30, 2011, knocking him out cold via left hook after only 12 seconds in the first round, and earning his second Knockout Of The Night award! It was the fastest KO of his career! Bigg Rigg defeated Josh Koscheck, via split decision at the co-main event of UFC On Fox 3, on May 5, 2012, via split decision. Johny Hendricks literally destroyed Martin Kampmann at UFC 154 on November 17, 2012, knocking him out cold after only 46 seconds into the first round, and winning his third Knockout Of The Night award. Hendricks was rescheduled to fight Carlos Condit at UFC 158, on March 16, 2013, after Rory MacDonald pulled back due to an injury, despite he was primarily set to fight against Jake Ellenberger. 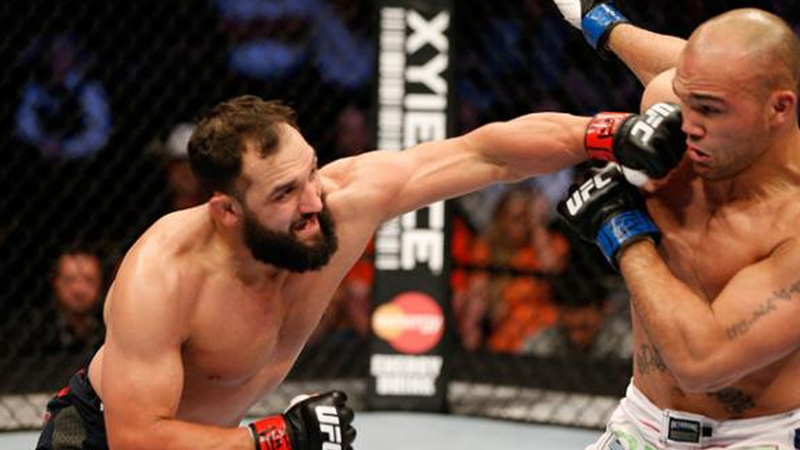 Johny Hendricks won the fight via unanimous decision, and both fighters received Fight Of The Night award. 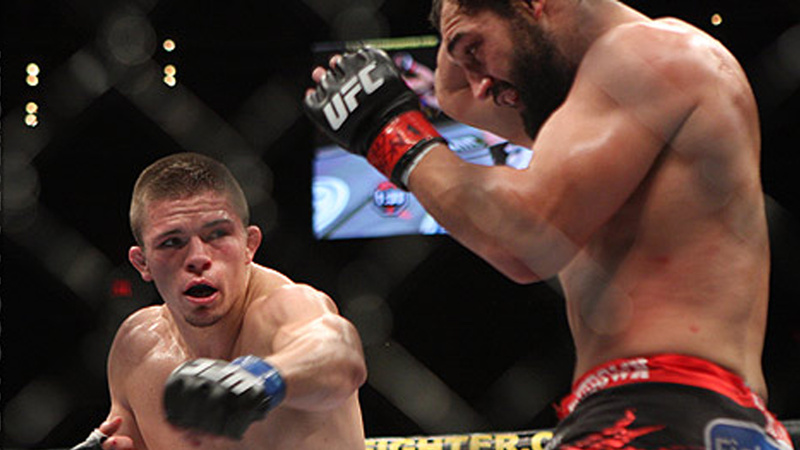 The two fought at the main event of UFC 167 on November 16, 2013. The fight lasted for five rounds and Georges St-Pierre won via split decision and both fighters received Fight Of The Night bonus. However, the fight will be remembered as one of the most controversial decisions ever. Each of sixteen MMA media members who were scoring the fight declared the fight as a decision victory for Johny Hendricks. Despite the controversy, both fighters received Fight Of The Night awards. Hendricks was sponsored by Reebok since this event. GSP vacated his belt one month later. The two legends in a Welterweight title shot at the main event of UFC 171 on March 15, 2014, in Dallas, Texas. After tremendous five rounds, both fighters earned the Fight Of The Night bonus, and Hendricks won vacated Welterweight title via unanimous decision. It was also the Fight Of The Year. After UFC 171 fight, Bigg Rigg had to undergo a torn bicep surgery he damaged before the fight with Lawler, and he didn’t train until May 2014. 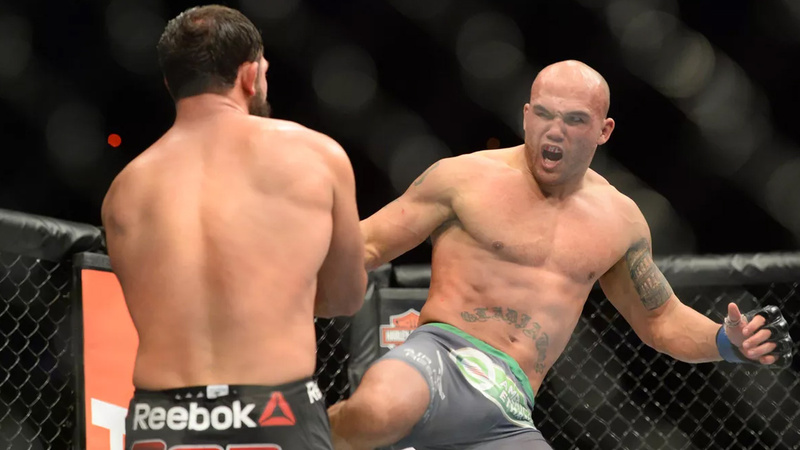 In the rematch, which happened at the main event of UFC 181, on December 6, 2014, we watched a completely different face of Robbie Lawler. The judges scored it 48-47, 47-48, and 49-46, and Lawler won via split decision. Hendricks opened up well in the first round but he was crushed by Lawler’s stamina in the later rounds. Johny Hendricks fought Matt Brown at UFC 185, on March 14, 2015. Hendricks had nine successful takedowns from ten attempts and neutralized Brown’s stand-up game completely, winning the fight via unanimous decision. The two faced at the main event of UFC Fight Night 82, on February 6, 2016. Stephen Thompson surprised everybody with his superior showdown. 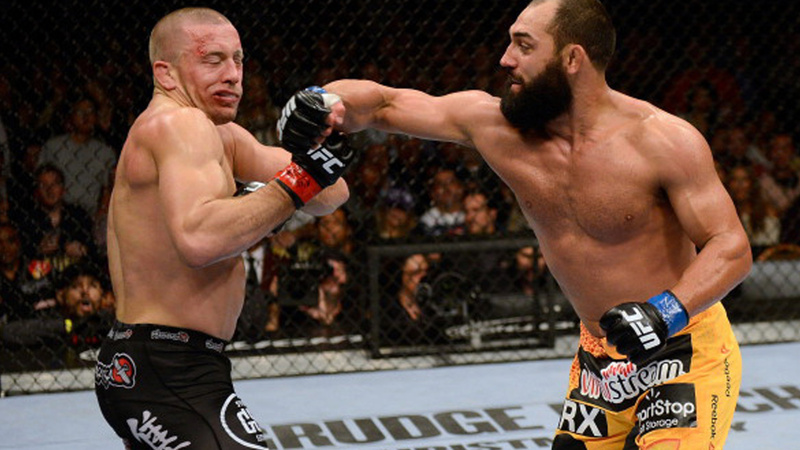 Johny Hendricks received a strong left spinning back kick to the body that rocked him. 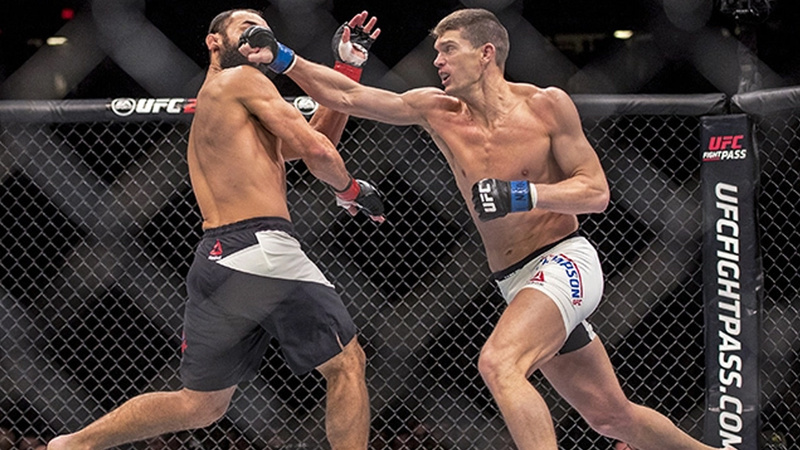 Stephen Thompson delivered two strong punches to the face and pushed him against the fence. After few additional punches, the referee stopped the fight and Wonderboy won via TKO. This was the first time Johny Hendricks was knocked out. Hendricks faced Kelvin Gastelum at UFC 200 on July 9, 2016, but he was 1.25 pounds heavier. Gastelum won the fight and Hendricks was penalized with 20% of his purse. Bigg Rigg is defeated by Neil Magny at UFC 207 on December 30, 2016, but he was 3.5 pounds heavier this time! He was fined 20% again. The fight was close and interesting to watch. Johny Hendricks moved to Middleweight and defeated Hector Lombard via unanimous decision at the co-main event of UFC Fight Night 105 on February 19, 2017. Hendricks missed weight again versus Tim Boetsch at UFC Fight Night 112, on June 25, 2017. He missed weight for the third time (188 lbs). Tim Boetsch rocked him with a right high kick in the first round. After few strong punches, Bigg Rigg dropped to his knees and the referee stopped the fight. Paulo Costa defeated Hendricks at UFC 217 on November 4, 2017, via TKO in the second round. That was the last fight of his UFC contract. Johny Hendricks is a devoted family man. He is married to Christina Hendricks and they have four children – Rigg, Avin, Adli, and Abri. His nickname, Bigg Rigg, has a very interesting background. His jiu-jitsu coach commented that Hendricks hits like a Mac truck and he also owns a Ford F-350. As a combination of these two facts, the famous moniker is created!